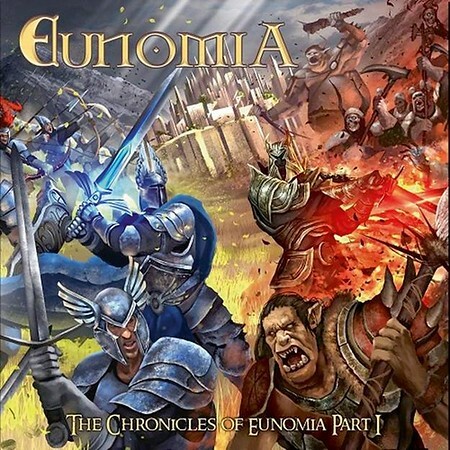 “The Chronicles of Eunomia Part 1” is a concept album from Norwegian power metal band Eunomia and it was released on 24th August through Pride & Joy Music. The tracks on the album relate to the struggles in the fantasy kingdoms of Valley Doom and Eunomia and they have been created by brothers Marius and Peter Danielsen. I included the track “Crystal Sword” on the Friday NI Rocks Show on 3rd August. The band Eunomia was formed in 2011 by vocalist Peter Danielson and alongside his brother, guitarist Marius Danielsen, they started working on what would become “The Chronicles of Eunomia Part 1”. An EP entitled “Crystal Sword” was released in 2013. The other members of the band are Magnar Wither Skorgenes on guitar, Alexander Ormseth on bass and Sondre Søresen Brøndstad on drums. The album commences with an intro called “The Beginning” which is followed by eleven more tracks, most of which are quite lengthy – six of the tracks are over six minutes long, with “Dangerous Times Ahead” being almost ten minutes long. There are guest appearances throughout the album, including singer Henning Basse from Firewind, vocalist Alessandro Conti from Luca Turilli’s Rhapsody, guitarist Victor Smolski from Almanac and formerly Rage, guitarist Sigund Kårstad from Darkest Sins, guitarist Esa Ahonen from Cryonic Temple etc.